Thank you, and good morning! I’m excited to be among such a distinguished group of Hampton Roads business leaders and community partners… And I appreciate you taking time out of your busy schedules to be here. Although I’m not originally from Hampton Roads, I’ve lived in Virginia for 32 years, 31 of those in Hampton Roads. I consider this home – it’s a wonderful place to live and to raise a family. 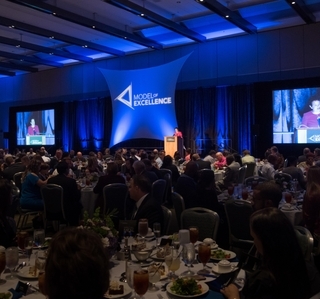 It’s also a great place to work, and the Peninsula Chamber does an outstanding job of creating opportunities like this for businesses and individuals to come together to connect and learn from each other. I’d like to thank the Chamber for organizing this event, and providing me with an opportunity to meet with all of you. 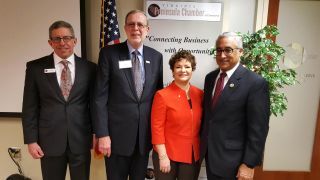 From left, Robert S. McKenna, president of the Virginia Chamber of Commerce, Dr. John Dever, president of Thomas Nelson Community College, Jennifer Boykin, president of Newport News Shipbuilding, and Rep. Bobby Scott of Newport News. Jennifer Boykin was the keynote speaker at the Peninsula Executive Leadership Council on Wednesday, March 28, 2018. So I’ll make a deal with you – I will share some of my insights with you if—at the end—you will share some of yours with me…Because I believe that one trait of a strong leader is the willingness to listen and continue learning from others… Whether they are executives, entrepreneurs, craftsmen, or interns…Because everyone see things differently, and you never know from where the next great idea will come. Fortunately for me, I’m surrounded by a lot of innovative and diverse people at the shipyard, and I learn something new every day. For those of you who know little about Newport News Shipbuilding, we are a 132-year-old company…And we are the nation’s sole designer, builder and refueler of nuclear-powered aircraft carriers. We are also one of only two shipyards capable of designing and building nuclear-powered submarines…And we provide fleet services for both submarines and aircraft carriers. Newport News Shipbuilding employs about 22,000 people, making us the largest industrial employer in Virginia. And one thing that I find to be unique about our workforce is many of our employees are third- and fourth-generation shipbuilders – so there is a lot of institutional knowledge to be gained. On the other end of the spectrum, we have a lot of younger talent entering the shipyard, and I continue to be amazed at their innovation and technical abilities. One thing I’ve learned during my 30-year career is that everyone knows someone who works—or has worked—at the shipyard. So I have to ask—if you don’t know someone from the shipyard, please raise your hand? We shall build good ships here. Today, we have the awesome responsibility to build upon the foundation Huntington created, and to create an even greater future for those who will follow us. Since being named president last July, my top priorities have been centered on people and technology. Today, they are the foundation of my vision for our future. I began my remarks by saying that one trait of a strong leader is the willingness to listen and continue learning from others…And that you never know when inspiration will strike. In recent months, some of the greatest inspiration and lessons have come to me from an unlikely partnering of history and hip hop. I was in New York over the holidays and I saw Hamilton, the musical about the life and times of American Founding Father Alexander Hamilton and the birth of our nation. Unlike traditional Broadway musicals, this one features both singing and rapping. And no, I don’t have “mad skills” to do either today. The past few months have been a bit of a whirlwind for me, and seeing this show helped me to take a break…And to let myself be inspired by something that on the surface has little to do with shipbuilding. If you are like me, though, it’s hard to totally disconnect from work and the responsibilities that come with it. It’s also hard for me not to relate everything back to the shipyard, even a hip hop musical. 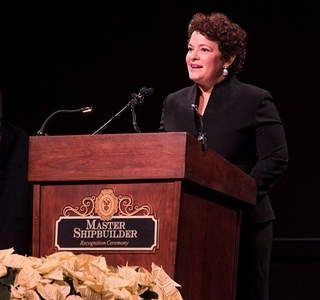 Today, I’d like to share with you three leadership ideas I’ve had since seeing the show that made a huge impact on me personally…And that also resonate with me professionally as I think about my vision for Newport News Shipbuilding and how I want to lead. The first idea is that it’s important to focus on today while also having a long-range vision for the future. The idea for Hamilton started when creator Lin-Manuel Miranda casually started reading an Alexander Hamilton biography while on vacation in Mexico. The more he read, the more his wheels started to turn, and soon, he says, hip-hop songs started ‘‘rising off the page.’’ His first vision was pretty innovative – a hip-hop concept album about the life and times of our nation’s first Treasury Secretary. What’s so inspiring to me is how his initial vision grew every time another person with a unique theater talent heard the idea. Each wanted to be part of it, and brought something new to it, until it became so much more than anyone of them individually could have imagined. It took Miranda seven years to write the show – the same amount of time it takes to build an aircraft carrier, by the way…And it took hard work, long hours and a belief that he was creating something larger than himself. And he did. I believe all great evolutions and revolutions – whether its history or music or business – require an intense focus on today’s immediate needs while keeping the long-range vision sharp. We are in the midst of this right now at the shipyard. Today, we are building the aircraft carrier John F. Kennedy and refueling the aircraft carrier George Washington. We have 11 Virginia-class fast attack submarines in various stages of construction…And last week, we cut the first piece of steel for the first Columbia-class ballistic missile submarine. We are busy, we are hiring, and we are focused on our work at hand. Yet we also have an eye toward the future. Last week, and even more noteworthy the Navy released a Request for Proposal for a two-ship aircraft carrier buy, which is the first step toward a two-ship contract award. For those of you not familiar with shipbuilding, this is a really big deal, and a historic milestone for us. The last time we signed a contract with the Navy to purchase two aircraft carriers was on June 30, 1988. In submarines, we just submitted a proposal for the next series of Virginia class submarines – a contract to build an additional 10 boats with our teaming partner, Electric Boat. Once awarded, both of these contracts will significantly increase our backlog…And lay the foundation for work we will perform into the year 2032 on ships that will serve our nation into the 2082 timeframe. This news provides greater work stability and greater opportunities for cost savings as we lead the way toward a 355-ship Navy. But it does more than that – it demonstrates that we are a critical part of the defense of our nation and that we are all part of something much greater than ourselves – today and into the next horizon. We get the opportunity to leave a legacy that will outlive us and positively impact a new generation of Navy sailors, shipbuilders and Americans. This brings me to my second Hamilton-inspired idea which centers on leveraging diversity for greatness. In his musical, Miranda perfectly illustrates just how diverse and different the Founding Fathers were. I love how this was depicted with heated cabinet meeting rap battles by the likes of George Washington, Thomas Jefferson and James Madison. Yet despite their differences – or rather because of them – they were able to establish a new nation and invent a whole new form of government. They ultimately set aside their own individual interests, and focused on the national interest for the greater good of our country. If they had not succeeded, we would not be sitting here today. Like Alexander Hamilton, I believe in the power of diverse perspectives—in bringing many different voices to the table and leveraging the ideas of everyone. The new Brooks Crossing development in Newport News’ Southeast Community is a great example of this – Diverse businesses, educational institutions, community and government organizations coming together for the greater good… To continue revitalizing, growing and developing this part of the peninsula. Earlier this year, the city broke ground on a new state-of-the-art facility that will house 600 shipyard employees – to include engineers and designers, IT professionals and planners. Our space in this building will be on the top three floors, where we will implement new digital technologies into our engineering and manufacturing processes – all of which will transform how we build ships. We are also extremely excited for the first floor, which will focus on community outreach in partnership with the City of Newport News and Old Dominion University. I’m very proud of the partnerships we have developed with such a diverse group of leaders to make this a reality. This facility will introduce kids in the Southeast community to STEM related jobs and fields of study. But it does more than that – It gives us the opportunity to grow and develop a new generation of engineers, scientists and mathematicians. By preparing them with basic skills, like software coding and computer programming, to level the playing field. Their legacies are still unwritten, and their futures are vast and unlimited. And who knows, maybe one of them will become a future shipyard president? This leads me to my third and final leadership idea inspired by Hamilton: And that is…Be brave! In one of the show’s most popular songs, the lyric – “I am not throwing away my shot” – has become an anthem for having courage. Transforming Alexander Hamilton and the Founding Fathers into a hip-hop musical was, in and of itself risky, innovative and different from anything that’s ever been done before. And on top of that, the creative team cast African American and Hispanic actors to play the Founding Fathers. That took guts. When the musical debuted in 2015, it disrupted the theater world, and has turned into one of the most celebrated musicals of all time. I believe bravery is required for greatness. And I believe that bravery matters today more than ever. There’s another Hamilton song lyric that has shaped my thinking. Alexander Hamilton asks Aaron Burr the question, “If you stand for nothing, what’ll you fall for?” My top priorities are people are technology. That’s what I stand for. With regards to technology, I stand for how we harness new ways of building ships with new technologies to work smarter. The world of manufacturing is in the midst of an industrial revolution… Of making factories “smart” – where a machine with artificial intelligence can visualize an entire production line…And help the decision maker with real time data to make immediate and efficient decisions. Hard to imagine? Think about some of the new apps that know real traffic information and tell you how to avoid it. We are on the cusp of this type of technology at Newport News Shipbuilding. We are working hard to modernize how we build ships, how we run our business, and how we improve the work experience for our shipbuilders. This brings me back to the most important attribute of Newport News Shipbuilding: Our people. Our people are our greatest investment, and it is their ideas – their talent – and their expertise that differentiate us from other companies. And it’s important to note, that this investment extends beyond the shipyard gates. 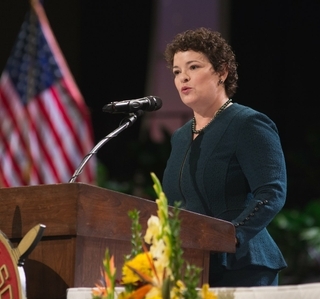 Our parent corporation, Huntington Ingalls Industries, offers programs to benefit the physical, emotional and financial wellbeing of our people. This includes comprehensive financial services to our employees…And an Employee Assistance Program to help employees and family members handle personal and professional issues. Two years ago, we opened a Family Health Center in downtown Newport News that provides primary care services that focus on prevention, early intervention and chronic condition management for all of our employees and their families. Inside the gates, we spend more than 70 million dollars annually on workforce training and development. And for nearly 100 years, our Apprentice School has served as the leadership academy for craftsmen and women – in fact four of my senior staff team members are graduates. While there is much we are doing, there is still much to be done. I’m going to be honest with you – for a company that builds the most complex ships in the world, we’ve still got some work to do when it comes to providing the basic human needs for our people. The number one issue we have is parking. It’s been a problem for us since cars were invented. It would be easy to say – we are on a peninsula, we have limited land, it is what it is, and it’s just part of working at the shipyard. But then I hear those lyrics…. “If you stand for nothing, what will you fall for?” And I remember… I stand for people… I stand for my workforce. This includes the things that act as barriers to creating a positive and engaging work experience for them. So we are taking the parking challenge head on. And we are going to fix it. It starts with me and my leadership team – creating the vision for our future. Because, until we believe it – we won’t see it. I believe we are going to solve it… Through bravery, innovative thinking, disruptive ideas, and the smart use of technology. We owe it to our people to solve it. My workforce gives their all, day in and day out – in the rain, in the heat, and in the snow. The work they do is challenging, but their work environment doesn’t have to be. So we are investing in facilities to bring more work indoors and out of the elements. And we are improving facilities like bathrooms and break rooms to make them more accessible and inviting. These are really basic needs, but just as they are basic, they are important.